You can trust that every time you buy a Grandpa’s Soap Bar that you are buying quality for a great price. I am not sure if this is true for all dudes but Lavender can sometimes seem a bit overwhelming and girly to me even though I was born in the country known for it’s Lavender. Lavender is actually quite an amazing plant and I can say that I actually have gotten super high on the stuff before. Yes, super high but that’s a different story. The reality though is Lavender has a lot of healing and comforting qualities and has been used for centuries by many different cultures around the world, just make sure to dose it right. The real reason I bought this Grandpa’s soap though was because it had Vanilla as one of the ingredients, I love Vanilla and it turns out that vanilla goes really well with lavender. 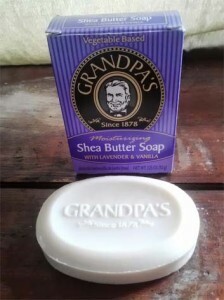 Grandpa’s Moisturizing Shea Butter Soap with Lavender & Vanilla is mild in scent and is very pleasant to the nose. It lathers really nice and thick and will moisturize the hell out of you. Great soap, Awesome Quality worth every penny.